Everyone who has been in the outdoors knows this horrible experience. We want to enjoy our trek, climb, or travel. But our backpacks, filled with everything including the kitchen sink, is wearing us down! Every step is a torture, and our shoulders feel as if they’re going to be wrenched off our bodies. If it’s only possible to simply throw away our ultra-heavy backpacks and go home! Well, we were in luck because Outpax knows this problem all too well. 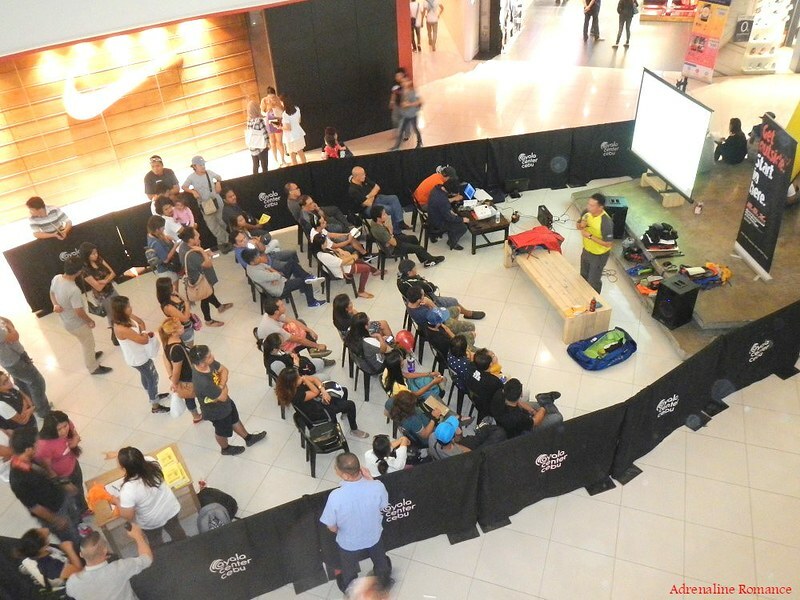 With the support of ROX Ayala, they organized an informative three-hour talk that reveals the long-sought techniques and secrets of fast and light backpacking. A little over 4PM, the event started in earnest. It was attended by both novice and veteran outdoorsmen as well as interested people who always knew they have a calling to become adventurers. The photo below may look like we have a sparse audience, but people kept coming in minute after minute. Soon, the entire venue was filled up! Mr. Leo Glenn Lao was the guest speaker. 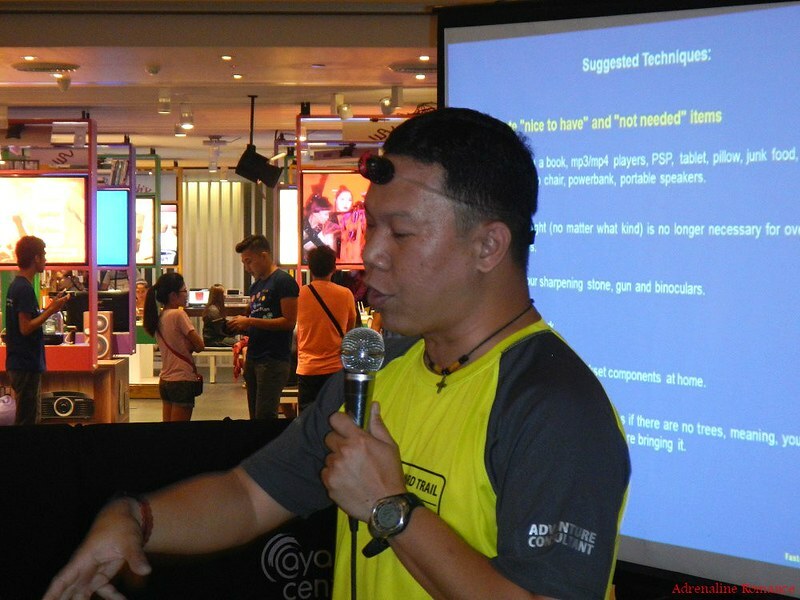 He is an expert outdoorsman, a former Scoutmaster of Ateneo de Cebu, and a member of the prestigious Cebu Mountaineering Society. 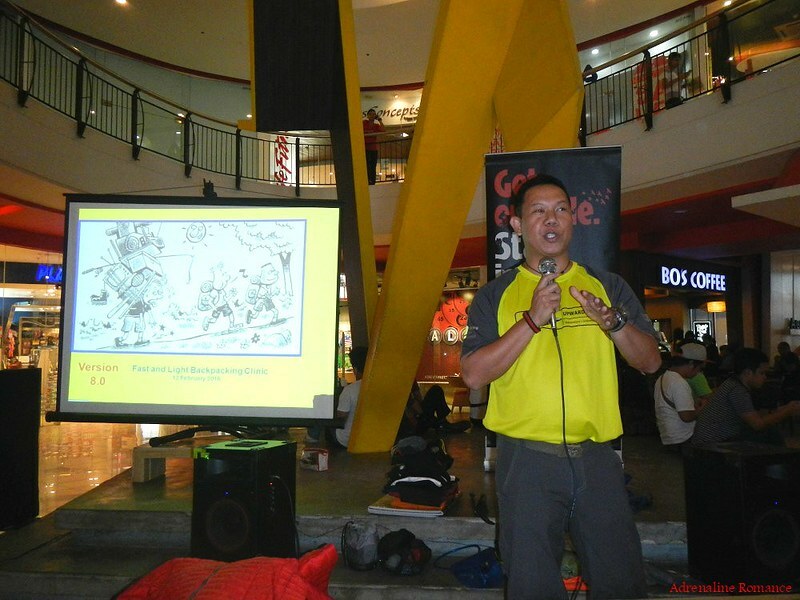 Currently, he is the founder of Upward Trail, an outdoor adventure consultancy firm. Yes, that’s right, people. Sir Leo is a true man of steel! 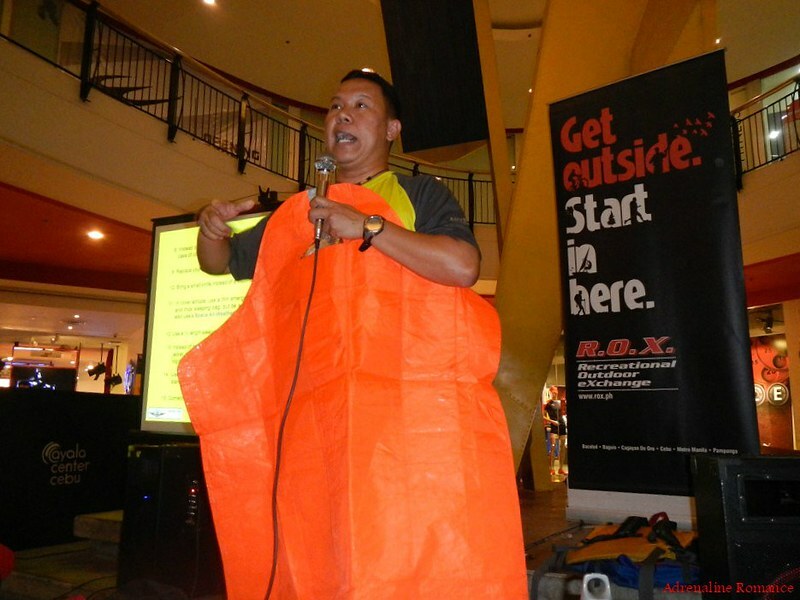 Sir Leo taught the audience simple but proven and innovative techniques that can shave a lot of weight off our packs to make backpacking enjoyable, less exhausting, faster, and safer. Many leading outdoor gear brands use advanced materials and state-of-the-art technology to innovate and manufacture light, strong, and reliable gear. No doubt about it, they are proven old-school gear. However, don’t get stuck in old-school items. Take advantage of modern gear to make your adventures a pleasant and safe experience. 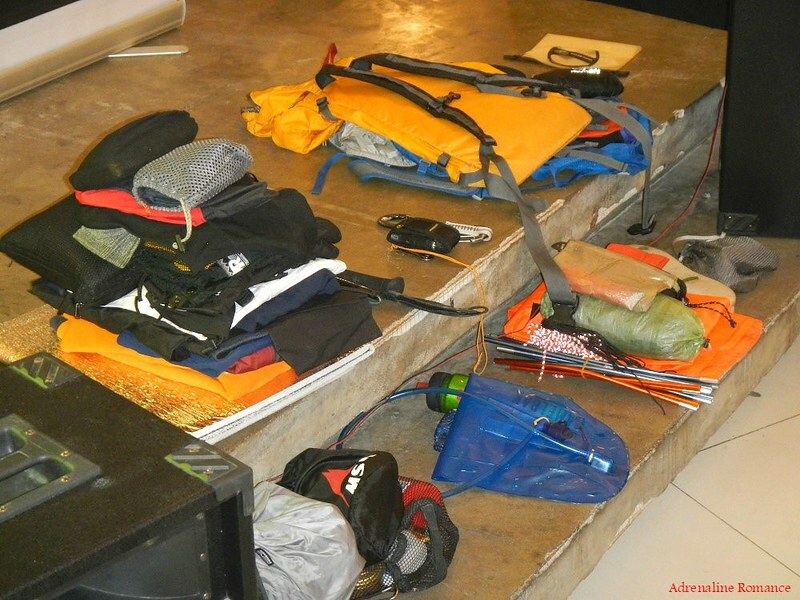 Sir Leo brought several high-tech outdoor equipment—hydration packs, day packs, carbon fiber trekking poles, bivouac shelters, burners, and more. 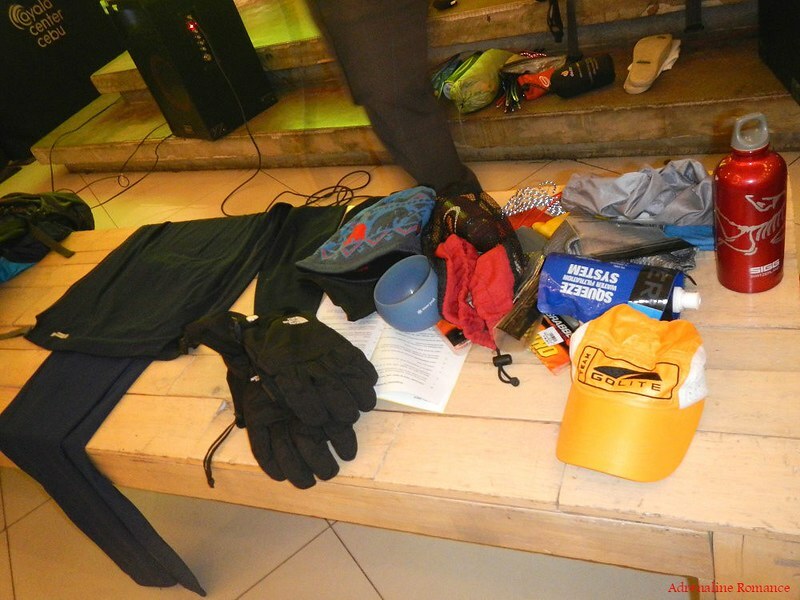 He then explained the modern and weight-saving technologies that make them essential items to bring in the wilderness. See that thing around his forehead? That’s a very lightweight and compact Petzl headlamp whose luminosity equals those of its larger counterparts. You won’t know you’re wearing it! 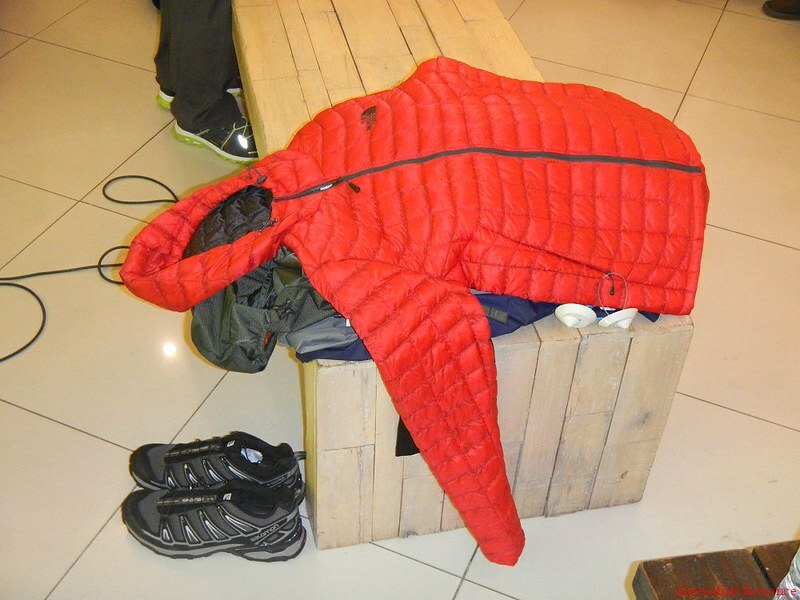 Sir Glenn also introduced us to outdoor garments that are made of advanced materials. These are especially useful for those who need to stay warm in cold environments but don’t want to bring extra bulk and weight of winter jackets. He also explained that layering (the technique of wearing several garments over each other to retain body heat) is the best way to keep comfortably warm. If you feel uncomfortably hot, you simply remove layers until you feel nice and cool again. In freezing places such as the Alpine region, you really need to wear winter jackets in addition to layered clothing to avoid being killed by the low temperature. Thankfully, new technologies are being incorporated into these jackets to make them lightweight. Not all lightweight and dependable items need to be high-tech and expensive. Creativity is a significant part of the race to save weight. 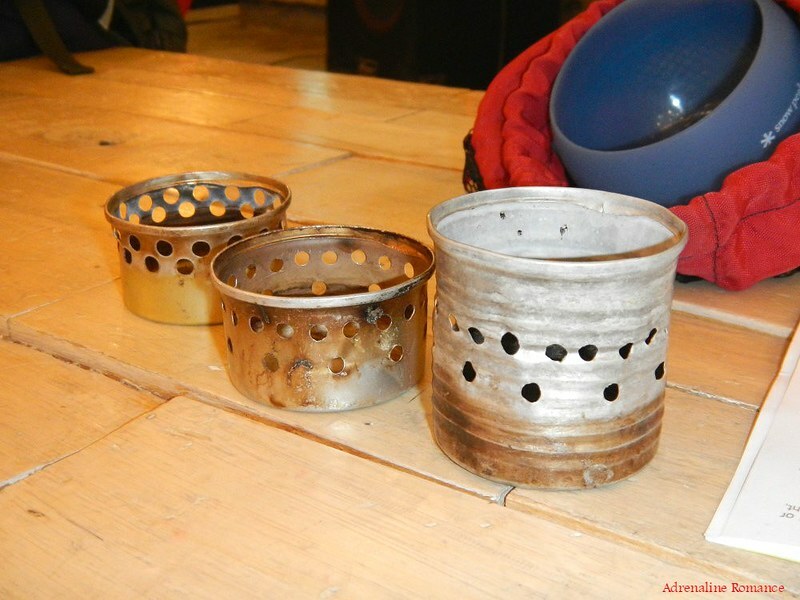 These are very simple outdoor stoves made of cat food tin cans. Holes are drilled to let jets of flames exit. Each of these stoves use denatured alcohol, which can be bought in any hardware store, as fuel. Don’t you know that these stoves were actually used by Boy Scouts? “Be resourceful,” Sir Glenn advised. Keep an eye on both everyday and unusual things that you can use as an alternative for heavy gear. For example, the item that he is holding is a rescue blanket commonly used by seamen and Coast Guard personnel. He said that a seaman friend of his gave it to him. The rescue blanket is very lightweight, compact, and effective in retaining heat. It can be used as an alternative for a bulky sleeping bag. 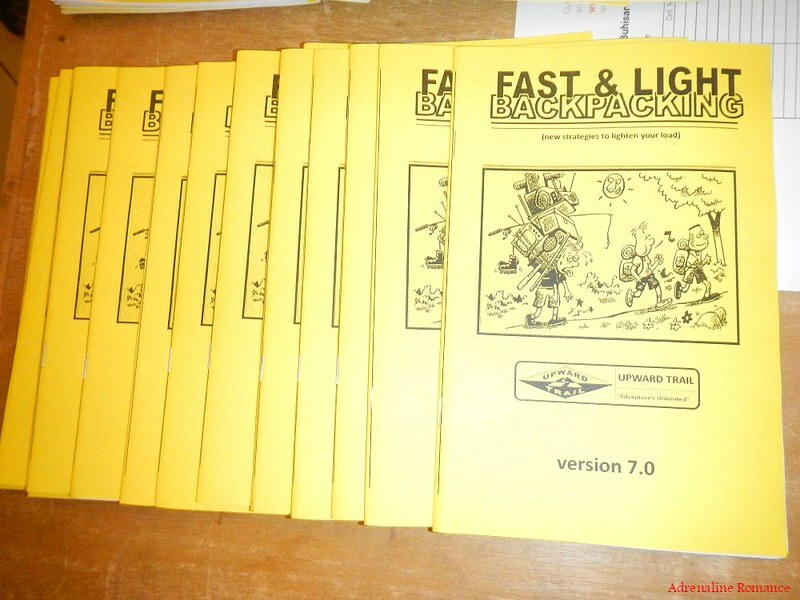 Upward Trail has published a booklet that includes detailed tips and techniques on how to lighten up your load in the outdoors. You can buy a copy for only P75. 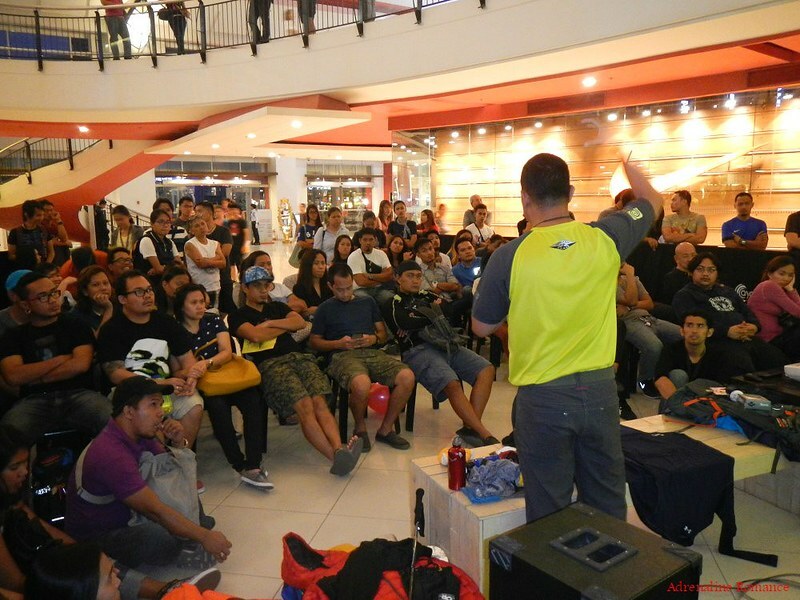 Overall, the Fast and Light Backpacking talk was a very successful event. Everyone in attendance learned new techniques in making their packs more comfortable to carry. Everyone also embraced the necessity of acquiring new technologies as well as preserving old ones to save weight. The best part? Everyone was encouraged to use their resourcefulness and creativity to make their packs less a burden in outdoor adventures. 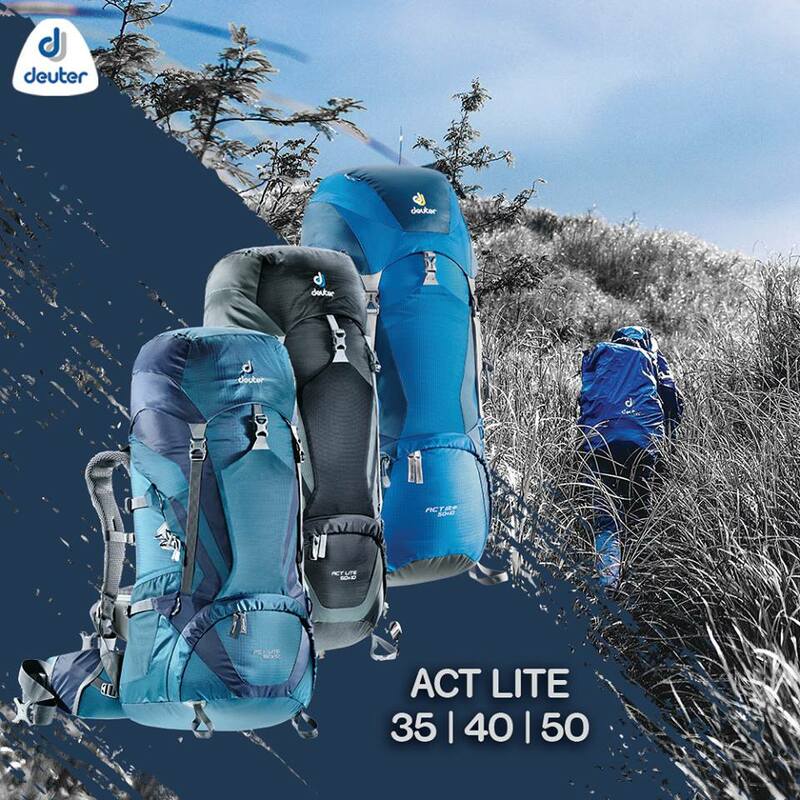 We’re pretty sure that in the coming weekends, we will encounter trekkers with lightweight packs, happily exploring wilderness trails. 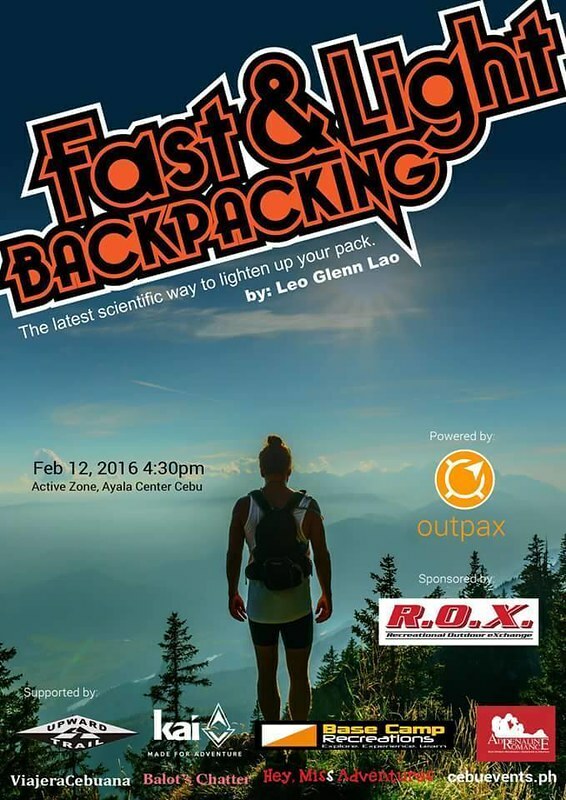 This event is powered and organized by Outpax. To organize and join events, click the Outpax logo below. The talk was very informative. Sir Glenn taught us innovative techniques in reducing pack weight. Are they doing it again? Most probably, yes. You can get in touch with Sir Leo by searching “Leo Glenn G. Lao” on FB. Alternatively, you can touch base with Eric Tunacao of Outpax for assistance. Very informative. Thank you for sharing ! Hehe! Sige lang, I’ll make necessary corrections.